A defiant adolescent turns against her mother, accusing her of "every bad thing." For many years, they have been acting out an oscillating pattern of communication: occasional meetings are followed by abrupt cutoff; awkward attempts at rapport are repeatedly sabotaged by hostile indictments. No end in sight. A blind baby is rejected by her grandparents, who cannot tolerate the presence of a sightless child in their family. A man takes sides with his wife and they both cut off from his sister, citing a litany of slights and insults. The estrangement persists for more than forty years. A proud woman incurs the unremitting wrath of her son-in-law for ridiculing and demeaning his mother. A young woman from an Orthodox Jewish family announces that she will marry a Catholic man. She is banished from the family and declared "dead" by her parents. Decades later, she is reunited with the surviving remnant of her family. A woman is deprived of a significant portion of her inheritance by her mother, who changed her will in favor of a younger sister. The bereft woman vows never to speak to her sister again. "My mother was the youngest child and the only daughter of her aging parents. I am uncertain about the place of her birth. She claimed to have been born in a small town in Pennsylvania, but she had no birth document and I suspect that she was brought to America as a babe in her mother's arms. Her Orthodox Jewish family came from a shtetl (small village) in Lithuania where they had survived more than one pogrom. From fragments of stories my cousins told, I gather that my grandfather was a sober, observant Jew, determined to uphold the laws and commandments of his forefathers. The rest of the family was eager to assimilate, to become Americans. There is one terrifying story, a secret kept hidden, that illustrates their struggle. One of my mother's brothers, anguished over a failure or transgression, journeyed to the country farmhouse of his elder brother and hung himself on a tree in the front yard. This ultimate expression of cutoff, when the family had not yet gained a foothold in the strange new world, must have been a terrible shock. My mother never discussed this episode, so I am left to wonder how my grandparents, who died before I was born, survived the grief and the shame. "Imagine that you could move backward in time, speak with your grandmother's grandmother and gaze at her face as she responds to your questions. What would she tell you about the daily life of her family, the crises they confronted, the rituals for their holiday celebrations, the prayers chanted at her father's funeral? Suppose you could trace the wanderings of each generation in your father's line, going back to the period of the first millennium. Imagine the multitude of places they inhabited before reaching the place you now call home. [i] W. F. Nerin, Family Reconstruction: Long Day's Journey Into Light (New York: Norton, 1986), 37. The book of Genesis depicts an awesome progression of expulsions and reunions. In the narratives of Cain and Abel, Isaac and Ishmael, Jacob and Esau, Joseph and his brothers, we find the basic ingredients of family life. “Many of these family relationships appear to be distorted or dysfunctional. Each of the patriarchs experiences the loss or separation from an older brother. In every generation, the expected order of succession is subverted and conflicts erupt between siblings. Woven into the tangled web of the family, there are ambiguities, deceptions, rivalry, and retribution. Despite all the upheavals in the lives of these parents and their progeny, the family survives and flourishes” (page 65). “…Profound lessons can be learned from these texts. The pattern of loyalties and grudges that emerges in the biblical family is reenacted in the present day, in the lives of actual families. A mother favors one son over another; the scorned son competes for recognition. A father gives up the struggle to determine the future of the family, creating a vacuum that others rush in to fill. The tensions that are generated in the midst of such turmoil affect all members of the family. They may be handed down to future generations, a pain-filled legacy. Or, by studying the wisdom of the ages, we may gain the insights that will resolve a stubborn deadlock” (page 82). "The act of writing is an ongoing exploration, a continuous learning. As I write about the lives of others, I discover new dimensions of myself. Listening to the stories of estrangement and pondering their meanings, I have come to see the sequence from alienation to reconciliation as a vital opportunity for personal growth and renewal. Examining an estrangement in one's own family is a journey without a clear destination. The benefits cannot be defined in terms of success or failure. It is not an event, done once and finished. Rather, it emerges as a series of stages that unfold over time, advancing and regressing in alternating progression. Similar to the musical form of a fugue, the process reverberates with themes and counter-themes, harmony and dissonance, sounds and silence. 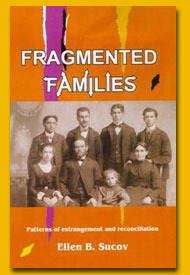 "When we reflect on these stories of families who have remained estranged, we can trace the evolution of hostilities. We see how hidden agendas and repressed grievances lie dormant and then flare up in spurts of accusations and retaliations, or remain buried in stubborn silence. What elements distinguish these families from others who have turned away from the anger, who have moved toward repair and renewal? In more fortunate situations, new insights kindle the aspiration for change. When the protagonists begin to modify their habitual behavior patterns, they are able to see their family in a new light. The occurrence of estrangement then becomes an opportunity for growth; it can actually serve as an incentive to clarify the boundaries of relationships and re-define one's separate identity. What appeared to be polar opposites - self and others, closeness and distance, right and wrong -- can be re-framed in more flexible, more constructive terms. As old animosities begin to dissolve, new modes of relating become possible. In the midst of this process, family members come to acknowledge a basic paradox of human existence: we know ourselves only in the context of living with others, and we experience relationships only in the effort to differentiate ourselves from others.